Product prices and availability are accurate as of 2019-03-12 07:14:01 UTC and are subject to change. Any price and availability information displayed on http://www.amazon.com/ at the time of purchase will apply to the purchase of this product. Organize pots, pans and griddles with the Rubbermaid® Pan Organizer! The stacking design creates additional storage in your kitchen to maximize cabinet space. 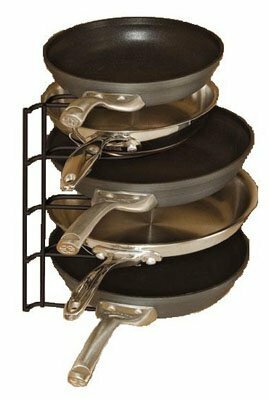 Keeping pots and pans organized in the rack helps protect pans from scratching. This free-standing kitchen pan rack is easy to install and includes optional mounting hardware. Rack accommodates up to two 14" pans and three 9" pans.